Juliet & Co organise guided walking tours of the historic city centre in English. There are a number of routes available including Classic Verona, which covers the medieval part of town, Romeo’s House, the Scala family house and graves, plus Erbe square and its lively market. Other tours include Shakespeare in Verona, Verona in the Moonlight and Verona Noir, which recounts the city’s ghastly past. Veronality offers 3-hour guided bike tours of Verona in English. 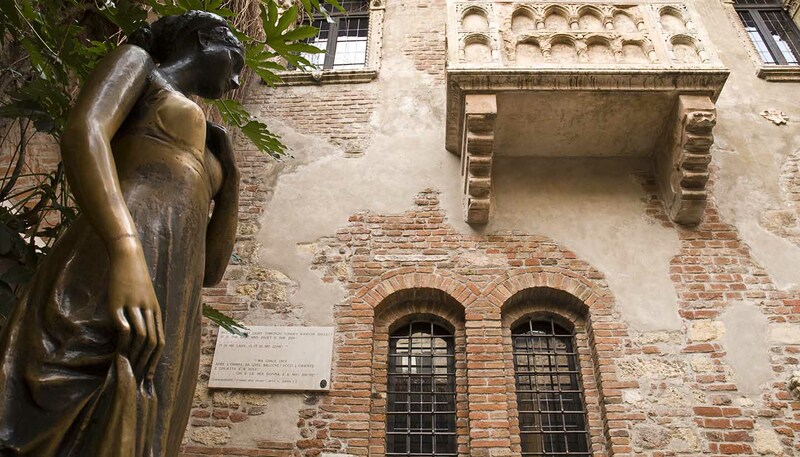 The tour stops at all the top attractions, such as Castelvecchio, Verona Arena, Ponte Pietra and Juliet's balcony. You'll also have the chance to visit the main squares and monuments while hearing fascinating and informative stories from your knowledgeable guide. Explore the Valpolicella district, a gentle, hilly landscape with several small valleys north of Verona, which is famous for its fine wines - the Valpolicella, the Amarone and the Recioto. The landscape is sprinkled with charming Romanesque churches, impressive Palladian villas, wine cellars, fortresses and parks. The region is justly famous for its cuisine, where boiled meat is an essential ingredient. Lake Garda, situated 30km (18 miles) west of Verona, is a jewel among Italy's many lakes. Charming villages and small towns dot the landscape around the lake. To the south the lake is characterised by gentle, Mediterranean-like slopes rising to the more dramatic steep hills and mountainsides further north. The lake is a hub for outdoor activities from gentle walks and boat trips to fishing, windsurfing and diving. Ferries traverse the lake regularly. At Malcesine, the rotating cable car to Tratto Spine takes visitors to a height of 1,760m (5,774ft) for amazing views.